The Silencer is one of the DC Universe's deadliest assassins...and you've never heard of her, until now! The Silencer Vol. 2 is part of the New Age of Heroes, a bold new line of comics starring a thrilling array of heroes. Reeling from her previous encounter with Talia al Ghul, The Silencer wants a permanent end to hostilities vis-a-vis several bullets into al Ghul's face. But when al Ghul's loyal followers want to revive her in the Lazarus Pit, Silencer must race to stop them while still trying to keep her personal life a secret! 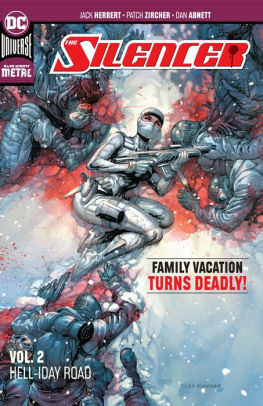 From superstar writer Dan Abnett (Aquaman, Infinite Crisis) and a cast of all-star artists comes The Silencer Vol. 2, continuing the adventures of a fierce metahuman as she attempts to escape her sinister past. Collects issues #7-12 and Silencer Annual #1. In the New Age of Heroes, the DCU expands as DC introduces a bold new line of comics starring a thrilling array of heroes--some you know, some you may have glimpsed in the pages of Dark Nights: Metal. They embody a spirit of epic, adventurous bravery--the kind you may remember from another era, but updated in an exciting way for today. Illustrated by DC's Master Class of artists, including legendary names like Jim Lee, Andy Kubert, John Romita Jr., Ivan Reis, Tony S. Daniel and others, these new series are great entry points for new readers and a welcome addition for longtime fans of the DC library.